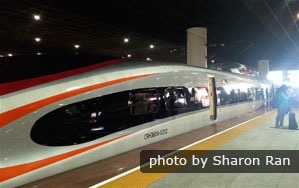 The Guangzhou – Shenzhen – Hong Kong Express Rail Link, also called the Guangzhou – Shenzhen – Hong Kong High-Speed Railway, links Guangzhou, Shenzhen and Hong Kong, and connect Hong Kong with the high-speed railway network in mainland China. The journey time from mainland China to Hong Kong and vice versa are greatly reduced. High-speed trains from Hong Kong to Guangzhou/Shenzhen depart from Hong Kong&apos;s newly-built West Kowloon Railway Station (Chinese: 香港西九龙站). They arrive at Futian, Shenzhen North, Guangzhou South railway stations as destination teminals. The shortest travel time for train journey from Hong Kong to Shenzhen North is only 19 minutes; from Hong Kong to Guangzhou South is only 47 minutes. 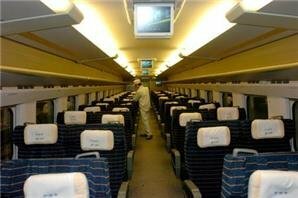 *There are 127 pairs of bullet trains running on the Guangzhou–Shenzhen–Hong Kong high-speed railway every day. Trains listed above are some of them. For up-to-date schedules, please see Hong Kong–Shenzhen–Guangzhou high-speed train schedules. 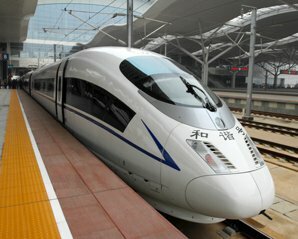 *There are 127 pairs of bullet trains running on the Guangzhou–Shenzhen–Hong Kong high-speed railway every day. Trains listed above are some of them. For up-to-date schedules, please see Guangzhou–Shenzhen–Hong Kong high-speed train schedules. 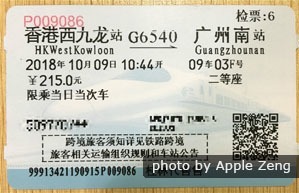 Tickets for Guangzhou – Shenzhen – Hong Kong high-speed trains can be booked online, by telephone, at train stations or at automatic ticket machines. The most convenient way is to book tickets online with a reliable travel agency like China Highlights. Guangzhou – Shenzhen – Hong Kong high-speed train tickets are open for booking 30 days in advance if booked online or by telephone, and 28 days in advance when booked at the train station. Search for the Hong Kong train and book tickets now. 1. Children below 1.2 m (3.9 feet) in height can travel for free, but without their own seat or berth. A child ticket is needed if a seat or berth is required. One adult can bring only one child (under 1.2 m) for free. If there is only one adult and more than one child, the other children need to buy children’s tickets. 2. Children 12 years of age and under, not taller than 1.5 m (4.9 feet) are eligible for children’s tickets. The children’s ticket price is half that of an adult ticket. 3. Children more than 12 years of age or more than 1.5 m (4.9 feet) tall need to buy adult tickets at the full fare. 1. Guangzhou – Shenzhen – Hong Kong high-speed trains are called "Dongganhao Chinese: 动感号". 2. Each train has 8 carriages. The first and last carriages are first-class. The remaining 6 carriages are second-class. Two wheelchair seats are available in the No.7 carriage. 3. The whole train has access to Wi-Fi. 4. First-class has four seats (2+2) arranged across the carriage width. Second class has five seats (3+2) arranged across the carriage width. 5. Each seat is equipped with power sockets. Each row of seats can be rotated 180 degrees. 6. Each carriage has luggage racks for large luggage. And there are luggage racks above the seats for suitcases less than 24 inches wide. 6. A handicapped restroom is available at the connection between carriage No. 7 and carriage No. 8, and equipped with a diaper-changing table. 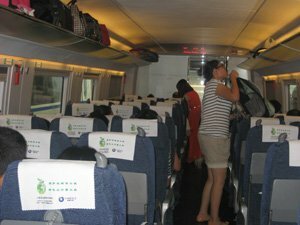 After the tickets are issued, China and Hong Kong Railways only allow changes on train number, seat class and travel date. Departure and arrival stations and passenger information cannot be changed. Changes should be made more than 30 minutes before departure time. If the departure station stated on your ticket is Hong Kong West Kowloon Station, then changes need to be made more than 1 hour in advance. 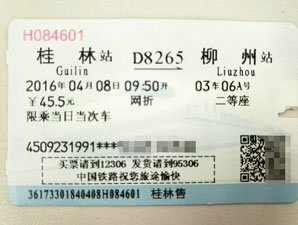 If no paper tickets have been collected, China Highlights will handle all the changes for you online. If paper tickets have been collected, you need to change the tickets at the train station yourself with the original ID documents. Changes need to be made more than 1 hour in advance. If tickets are issued using system of Hong Kong Railway, then we cannot change the tickets for you. You need to make the change at Hong Kong West Kowloon Station with your original passports. 1. Cancellations should be made more than 30 minutes before departure time. If the departure station stated on your ticket is Hong Kong West Kowloon Station, then cancellations need to be made more than 1 hour in advance. 2. If no paper tickets have been collected, China Highlights will handle all the cancellations and refunds for you online. 3. If paper tickets have been collected, you need to cancel the tickets at the train station yourself with the original ID documents. 5% of the ticket price if make cancellation more than 15 days before departure. 30% of the ticket price if make cancellation 48 hours – 14 days before departure. 50% of the ticket price if make cancellation less than 48 hours before departure. Please note: if your tickets are issued using Hong Kong Railway&apos;s system (e.g. tickets are issued on MTR&apos;s website), then we cannot cancel the tickets for you. Cancellations need to be made at the ticket counters in West Kowloon Station with passengers&apos; original passports.